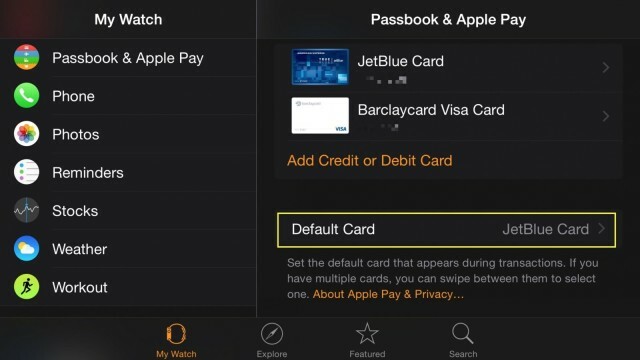 Set your Apple Pay default credit card for your Apple Watch on your iPhone. If you have more than one credit card, chances are you’ll want to put them all into Apple Pay so you can use any of them when the mood strikes, or your card balance dictates. If you’ve got an Apple Watch, you’ll need to add them to the Watch via a separate process than the way you added them to the iPhone. Once you’ve added more than one card, though, you might want to change the default Apple Pay card. Here’s how to do just that. First of all, you’ll need an Apple Watch paired with an iPhone 5 or later. You’ll need iOS 8.2 or later on your iPhone, you need to have the United States as your selected region, you’ll need to be signed in to your iCloud account on both devices, and you’ll have to have a supported credit or debit card from a participating bank. Oh, and you’ll need to have a passcode on your Apple Watch, and you’ll have to turn on Wrist Detection on your Apple Watch. Whew. Once you’ve got all that settled, you’ll need to add at least two cards to your Apple Watch and again to your iPhone. We’re not sure why you have to do this twice, since all the info on your Watch comes from your iPhone in most other cases, but there it is. 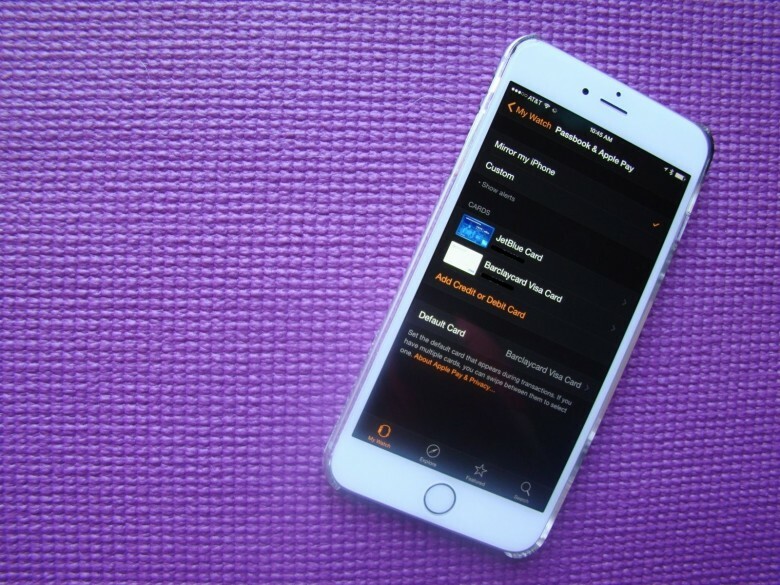 Launch your Apple Watch app on your iPhone, and swipe down to Passbook & Apple Pay. Tap there and you’ll see the option to Mirror your iPhone (this only applies to Passbook), and the cards you’ve added to your Apple Watch. Right below that section is the Default Card option. Tap there, and choose the specific card you’d like to automatically get used when you pay with Apple Pay from your Apple Watch. Hit the Back button in the upper left when finished, and then the Home button to get back to your iPhone’s main screen. 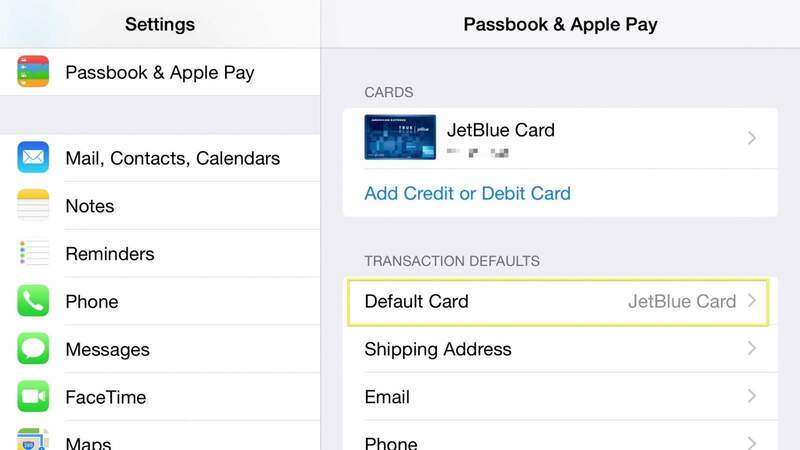 To do the same thing on your iPhone, launch your Settings app, swipe down to Passbook & Apple Pay, and then, in the Transaction Defaults section, tap on Default Card. Choose the card you’d like to use there and you’re all set. Do the same thing on your iPhone. Note that you can use any card you’ve added to your Apple Watch or iPhone when using Apple Pay — this just affects which card your device will default to. You can swipe through the various cards when you activate your Apple Watch or iPhone’s Passbook app at any time.